At the beginning of our country, people gardened for survival, growling fruits and vegetables for the table. Landscape architect and historian Rudi Favretti wrote that the garden until 1850 remained basically the same form as that in colonial America. But then everything changed with industrialization when the use of the machine to manufacture everything from cloth to furniture gave the middle class leisure time for such hobbies as ornamental gardening. Notice the two women enjoying their leisure in this Lippincott catalog cover of 1896. That was when gardening became important as a hobby for the middle class. 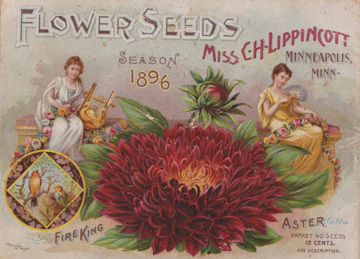 So it was no surprise that seed and nursery catalogs appeared at homes across the country, selling the latest for the gardener. The illustration of a home landscape that appeared on the garden catalog cover encouraged a style of gardening that would flourish from coast to coast: the romantic English garden style.